Minimum Eligibility Criteria:- Pass in 10+2 examination /equivalent examination with at least 50% marks in aggregate in 5 subjects including English as compulsory subject along with 4 subjects with the highest score out of the remaining subjects. 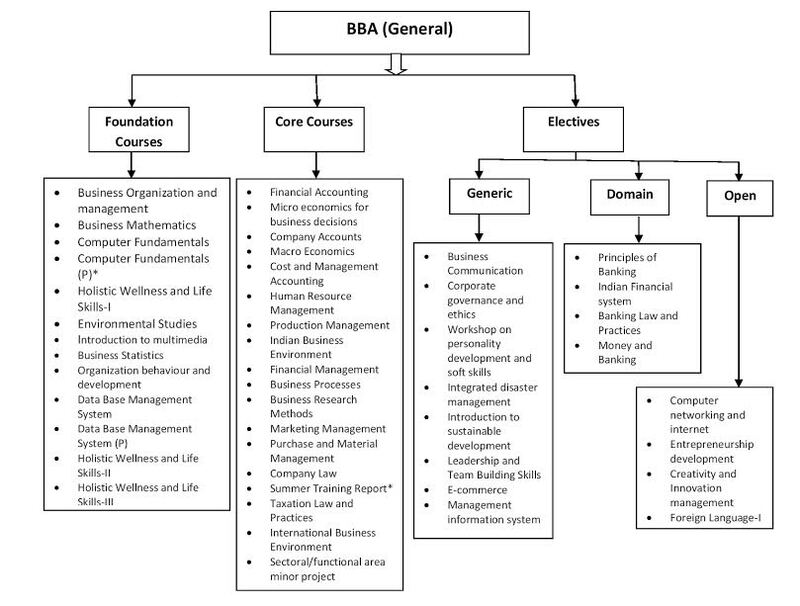 The following Foundation Courses, Core Courses and Elective Courses (Generic, Domain Centric, and Open) shall be offered during the Bachelor of Business Administration (General). Reputed companies and MNCs regularly visit the campus to interview the students. The graduates are chosen by MNCs and business houses in the areas of Manufacturing, Export / Import, Operations Management, Human Resource Management, Financial Management, Marketing, and other allied fields. All the programmes are comprehensive and are complemented with extensive classroom teaching & practical assignments based on industry requirements. The graduates are prepared to work as managers in multinational companies and reputed Indian companies such as Management Trainee, Marketing Executive, Human Resource Executive, Business Development Executive, Technical or Non-Technical Support staff at KPO / BPO’s, General Administration, Sales Executive, Client Services, Executive Associates, Telesales etc. across industries including Financial Services and Insurance Sector, Supply Chain Management, Customer Relationship Management, Operations Management, Marketing etc.